The father of modern computer science, Alan Turning paves the way for esoteric mathematical computations that, when used by Nazi Germany's Ahnenerbe-SS to perform a summoning, results in an unexpected evil brought to Earth through a portal to an alternate universe, a result that forces computer-hacker desk jockey Bob Howard into the unexpected role of world savior. Original. 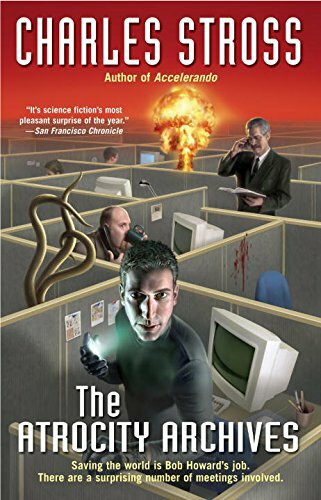 Amazon.com description: Product Description: Charles Stross takes a departure from his epic science fiction to craft this cross between Len DeightonÃ¢ÂÂstyle espionage and H.P. Lovecraftian horror. Bob Howard is a computer-hacker desk jockey, who has more than enough trouble keeping up with the endless paperwork he has to do on a daily basis. He should never be called on to do anything remotely heroic. About: The father of modern computer science, Alan Turning paves the way for esoteric mathematical computations that, when used by Nazi Germany's Ahnenerbe-SS to perform a summoning, results in an unexpected evil brought to Earth through a portal to an alternate universe. About: The first novel in Hugo Award-winning author Charles Stross's witty Laundry Files series. About: Computer science guru Alan Turning paves the way for esoteric mathematical computations that Nazi Germany uses to perform a summoning, bringing an unexpected evil to Earth through a portal to an alternate universe.